A 25th anniversary party is a big event, one that celebrates a quarter of century of love and commitment between two people. 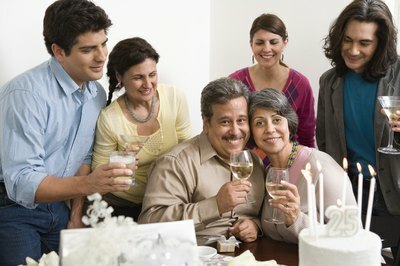 Throwing a 25th anniversary party for your parents can require a lot of planning and organization, but it is well worth it. 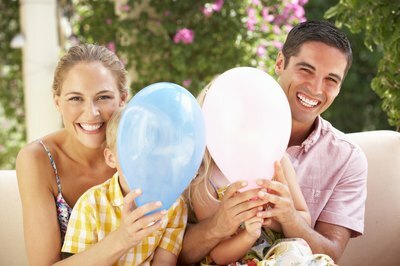 Planning a party to celebrate a 25th anniversary is a great way to thank your parents for being an example of love and support in your life, and to give them a day of pampering they will greatly enjoy. Determine your budget for the party. To do this, make a list of the requirements for your party: Invitations, venue, decorations, entertainment, food, drinks and any other special elements you want to include. After you have made the list of requirements for your 25th anniversary party, allot a certain amount of money to each area. Average out the price of each of these things, and decide how much you are willing to spend. By setting a budget first - and sticking to it - you will be less likely to overspend on things that you don’t need. Choose the type of party you want to have. Decide if you want to do a cozy at-home affair or a large party at a rented venue. Also think about whether you want to have a formal dinner or just offer finger food. Finally, decide on a theme for the party. Do you want to have a Luau, a beach theme, or a theme for the year your parents were married? If you don’t want to use a theme, just choose the colors you’d like so you can begin to gather supplies. Print out a guest list. While you are deciding how many people to invite to the party, keep your budget in mind. The size of the party will have a huge impact on your budget, because more people equal more supplies. Choose a venue, based on the number of people you are having. 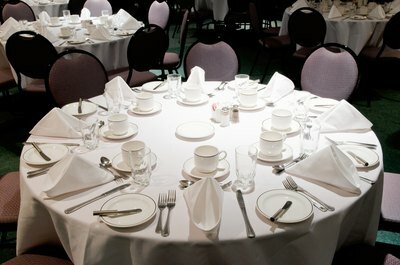 If you are renting a venue, research different banquet halls, community centers and party rooms in restaurants and bars. Be sure to ask if they allow outside food, or if you must use the venue’s catering services. Decide on a menu. Will you offer hors d’oeuvres and snacks, or a sit-down or buffet dinner. If you are hosting the party in a home location, or you are renting a venue where you can bring in outside food, consider asking friends and family to donate a dish. Also, decide if you want to have a wedding cake. A fun idea is to make a replica of the cake they had at their own wedding, and have them cut the cake again just like they did 25 years ago. Buy or make invitations. Include the reason for the party, the address of the venue, the time the party begins and ends, the R.S.V.P. date and contact information. You also should include the theme of the party, the type of meal that will be served and whether or not it is a surprise. 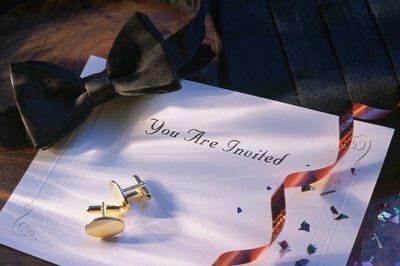 Typical etiquette calls for anniversary party invitations to be sent six to eight weeks in advance, although four to six weeks should be enough notice if the party isn’t planned for a busy time of year such as holidays or summer months. Plan the entertainment. Will you have a band, disc jockey, or will you be the disc jockey with a playlist? Will you be renting sound equipment, or using your own? Also decide whether you want to have games, giveaways or a special gift presentation to the couple of honor. One excellent source of entertainment is to present a slideshow of pictures from the couple’s life together after dinner. Buy decorations. Scour discount stores for cheap table linens, napkins, plates, glasses or cups, and even vases for your centerpieces. These types of places often sell very low-priced glass plates, bowls, and glasses. Shop for decorations at your local party store, and create centerpieces using silk flowers, decorative stones, vases, or floating candles. Delegate jobs. Ask someone to take pictures, and someone else to do a video. Ask a younger friend or relative to be in charge of a guest book in which people can sign and write special messages, and assign someone the job of giving the toast before dinner, unless you want to do it yourself. Use a party-planning list to help you organize the event. Set a due date for each item on the list so you’ll have everything done on time with no last minute emergencies. Sell extra dishes, centerpieces, and decorations you bought for the party online, or post them on wedding discussion boards. You’ll be surprised how many people are looking for these types of items at a discounted rate, and you can make some of your money back.